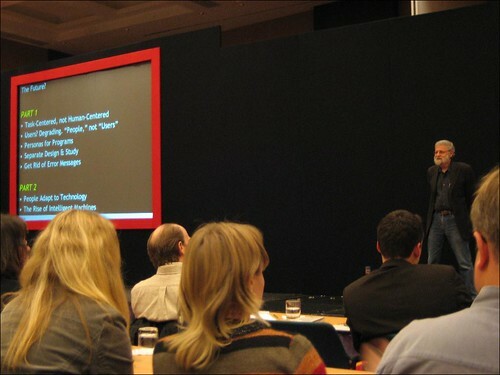 I’ve been at User Experience 2006 (London). Don Norman looks even more like Capt. Birdseye than normal, but he had some good things to say along with bashing Microsoft and spending rather too long talking about cars. A good day out I think – and one that also might need to see me revise my attitude to Alan Cooper. Looks like you were in one of the larger sessions. I was in two smaller ones (Designing B2B websites and Content Management for websites and intranets). Small group size made interaction and feedback to the presenter really easy – what was it like in your sessions? Oh, and what is/was your attitude to Alan Cooper? Feedback was pretty lousy really. I was in The Persona Lifecycle and (today) Designing Complex Applications, both of which had about 50 people in them. Incidentally. I thought the former session was rather good, but the latter pretty poor. I need to review the handouts a bit more before I decide exactly how bad it was. Most of my problems with Cooper revolve around his general insistence that you should only design for one persona. I think this makes little sense when it comes to web sites. The course on Monday made me concede that he has also made a lot of sense in other areas though. You can read my views on him here.